Q. Is a Safe Room just as good as being Underground? A. Yes, with the new technology studies they show that when the Safe Room has been built to meet FEMA Requirements and have passed the Texas Tech Impact Test they are just as good as an underground shelter. Q. 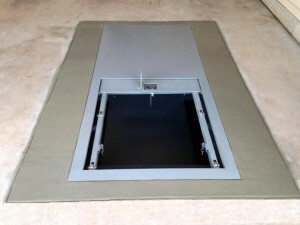 Do your Safe Rooms meet FEMA Requirements? A. 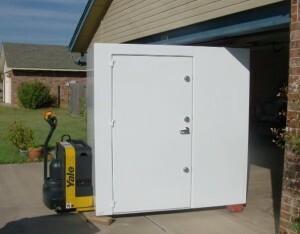 Yes, our Safe Room meet and exceed FEMA Standards. Q. Have your Safe Rooms been tested by Texas Tech? A. Yes, our Safe Room have been tested by Texas Tech and they have passed the Texas Tech Impact Test. Q. How long does it take to install the Safe Room? A. 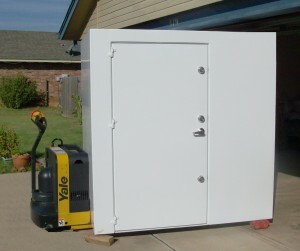 When your Safe Room is delivered it is already built, so there is no assembly when we arrive with your Safe Room. Installation typically takes about 30-45 minutes. Q. How is the Safe Room attached to the slab? A. We use anchor bolts every 12″. Each bolt has 10,000 pounds of sheer strength. Q. How thick is the Steel in your Safe Rooms? A. We use 1/4″ Steel in our Safe Rooms. Q. How wide are your doors in your Safe Room? A. Our doors are 36″ wide and are wheelchair accessible. Q. Is there a floor in your Safe Rooms? A. 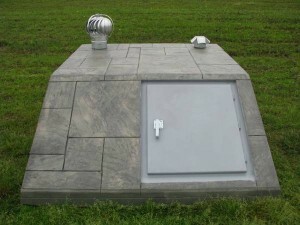 Out Steel Safe Room’s are completely encased in Steel and they do have a Steel Floor. Q. How long does it take to make and actually install the Safe Room? A. 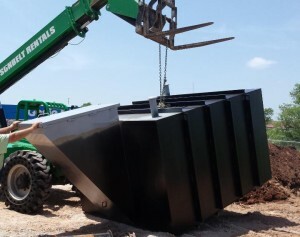 Typically it takes about 7-10 days after we get a contract which includes how you would like to Safe Room built. Q. Is there a Warranty on the Safe Room? A. Yes, we have a 10 year warranty on our Safe Rooms against leaks or corrosion.